(From Nikon lens literature) Nikon Inc. has announced the new AF-S DX NIKKOR 16-80mm f/2.8-4E ED VR lens -- an amazingly versatile DX-format lens that is well suited for advanced and enthusiast photographers. The NIKKOR 16-80mm features a combination of the best Nikon lens technologies, some never before seen in a Nikon DX-format lens, including Nikon's legendary Nano Crystal Coat. The resulting lens gives a wide variety of photographers an all-purpose optic to help take their photography further and tell their story with clarity and precision. "The NIKKOR 16-80mm f/2.8-4 is a very exciting addition to the NIKKOR DX-format lens lineup, and a new milestone in the NIKKOR legacy -- it combines the most advanced optical technologies with an extremely useful focal range to capture photos and HD video," said Masahiro Horie, Director of Marketing and Planning, Nikon Inc. "This new lens is a great companion for Nikon's high-performance, lightweight series of DX-format DSLR cameras." Make no mistake, the new AF-S DX NIKKOR 16-80mm f/2.8-4E ED VR is premium glass for those who desire a fast and highly capable wide-angle zoom lens. The lens features a popular, wide 24-120mm (FX-format equivalent) focal range, which makes it ideally suited for a variety of shooting disciplines. From wide-angle landscapes, tight portraits or for those looking for an all-in-one tool for travel, this lens does it all. The large f/2.8 - f/4 aperture lets photographers shoot in challenging light with ease, with the creative flexibility afforded by a shallow depth-of-field. Whether photographing friends' faces or a festive plate full of local flavor, the 16-80mm's fast aperture lets users blur the background to create that dramatic separation between subject and background that emphasizes and flatters a subject. For creative close-ups of everything from passion-projects to flowers, the lens has a very useful minimum focusing distance of merely 1.2 feet throughout the entire 5x zoom range. To further enhance its low-light capability, the new NIKKOR 16-80mm f/2.8-4 lens also features Nikon's Vibration Reduction (VR) image stabilization technology, which provides up to 4 stops of image stabilization, helping to create sharp images while shooting handheld or in challenging light. As an added benefit to landscape and wildlife photographers, this lens features VR with automatic tripod detection, to counteract vibration when mounted on a tripod. 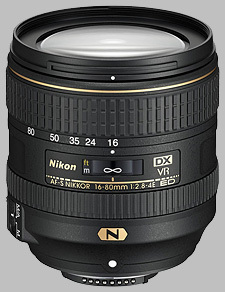 The new AF-S DX NIKKOR 16-80mm F/2.8-4E ED VR boasts some of the best optical innovations from Nikon, and is the first Nikon DX-format lens to wear the gold "N" emblem, to indicate the presence of Nikon's exclusive Nano Crystal Coat. This advanced optical coating significantly reduces instances of ghosting and flare for the highest quality images. The front and rear elements also integrate a fluorine coating to make it easier to remove dirt, moisture and smudges from the lens surface. This is also the first Nikon DX lens to feature an electromagnetic diaphragm; this innovation electronically adjusts the aperture within the lens, resulting in consistent exposure during high speed shooting. The new NIKKOR 16-80mm lens features robust construction while retaining a lightweight and compact body. The lens features four Extra-Low Dispersion (ED) elements and three aspheric elements to further combat instances of ghost, flare and chromatic aberration. The lens is constructed of 17 elements in 13 groups, and features a seven-blade diaphragm to create a circular, natural bokeh for a pleasing out of focus area of the image. For fast, accurate and quiet AF performance, the 16-80mm also features Nikon's Silent Wave Motor (SWM) technology. The new Nikon AF-S DX NIKKOR 16-80mm f/2.8-4E ED VR will be available in July for a suggested retail price (SRP) of $1,069.95. It is an OK lens, but there are better alternatives. I recently had a chance to rent Nikon's 16-80mm DX lens for several days, specifically to see whether it was worth upgrading from the old 16-85mm DX lens which I've used for a couple of years. The testing procedure was simple - I shot plenty of London landmarks and other spots familiar to me, most of which I had already photographed with my lens. The more considered reviews I've seen of the 16-80mm lens usually conclude that it clearly outperforms its older sibling, but is also overpriced for the improvement you get. Frankly, that is pretty much what I found too, and yet, I was more impressed with the 16-80 lens than I expected to be. It is often obviously sharper than the 16-85, across most of the frame, and it achieves that even at wider apertures - so if the 16-85 lens performs best at f/8 for a certain focal length, the 16-80 is likely to at least match it at f/5.6 or f/6.3. The additional light was far more useful than I expected when shooting handheld indoors and at night, giving me far fewer flawed shots. Distortion is bound to be there for this zoom range, but isn't an issue if you shoot JPEGs with distortion control turned on. Zooms tend to be weaker at the telephoto end of their range, although I didn't see a significant drop in performance with this lens. Occasionally the lens didn't perform so well with daytime landscapes, but I think that's down to small inaccuracies in Nikon's AF, which I also get with the 16-85 lens when shooting stuff at infinity. That aside, the 16-80 lens does have other shortcomings, some shared with its older sibling. For starters, the bokeh has a jittery, double-edged quality, although the 16-80 lens is smoother. Coma is sometimes visible with both lenses; for example if shooting a cityscape at night, lights atop buildings will be somewhat smeared away from the frame centre. Also, the copy of the lens I rented had a surprisingly stiff zoom ring despite being apparently in mint condition, which made me wonder if this was typical or not. With 24-megapixel DX sensors now the default, the older 16-85mm design can barely keep up. That in itself makes the 16-80mm lens almost an essential buy if this versatile zoom range is what you want; it still falls short of really doing justice to the sensor and won't outperform a good prime lens, but it can deliver some surprisingly good results. At 2018 prices, however, it still looks expensive for what it is, and in my view Nikon ought to discontinue the 16-85mm lens and bring the price of the 16-80 down by at least a third. If that doesn't happen, the 16-80 is still eminently worthwhile if you can grab a cashback deal or find it secondhand - which is what I'm hoping to do eventually. After doing careful testing with this lens I was very impressed. Using a large (2' x 3') ISO 12233 chart I found the resolution to be outstanding. Later testing at distant objects I was similarly impressed. The flare resistance is excellent (probably Nikon's new coating) and almost no CA. Amazing. I did note that at 16mm there was some barrel distortion and a touch of pin cushion distortion at 80mm. It should be noted that ACR (Adobe Camera Raw) now provides a lens profile for this lens which totally resolves the distortion problem - but it uses a small bit of cropping on the final image. Depending on the subject matter, this can be used or not used. Most scenics simply don't need it. To see the actual test results at 100% go to http://dustylens.com/lens_tests.htm and scroll to the bottom. To my amazement the lens resolution matched the now famous Sony 90mm f2.8 macro. In short, the finest DX lens I have tested to date! By the way, I also own the Nikon 18-140 and have tested it. Yes, it is excellent - but not in the same league as the Nikon 16-80 f2.8-4. Instant autofocus and aperture setting for crisp, quick shooting, excellent long-wavelength color rendition. Overpriced, bad flare toward the sun, resolution softer at 80mm. I tested a rented copy of this lens, a few years ago, and later found one, which the seller claimed had been pulled from a D500 kit, at a pretty good price. But AF and aperture control stopped functioning within a week or so, and had to be repaired by Nikon USA. See, below. These comments refer to both copies of the lens I tested, but mostly to the one I've bought. Flare when the camera is pointed near the sun is quite noticeable. In those situations, a hood would be obligatory. But it came with one, if I ever remember to use it...and can figure out which one it is. Resolution at 80mm very good, maybe better than the 16-85, but just a bit softer than at shorter focal lengths. That's to be expected when one compares the full extension of that zoom with the middling 80mm position of, for example, the 18-140. But there's really not much difference, and it's easily ignored. MTF charts seem essentially correct, although I shoot at f/8, for which the lens is apparently optimized. I might see slightly better contrast with the 16-80, than with, say, the 18-140 or 16-85, but if it's there, it doesn't amount to much. Autofocus, with the 16-80, is amazingly fast, as, probably also, is aperture setting within the diaphragm, now that the lens has been repaired. Shooting is very crisp and smooth, probably for those reasons. That matters when I use this lens as a workhorse in my "mountain scenery" bag. The lens doesn't work particularly well with extension tubes. It searches for focus, and finally finds it. I haven't tested it with the Kenko teleconverter, as it "lives" with my super teles. I only use spot focus, so I didn't test any of the Nikon focus modes with this lens. Spot focus is very good, and it's faster with the 16-80 than with the 16-85. I saw no difference between those two in respect to VR performance. They're both advertised as 4-stop improvement, and whatever it might really be, they hold equally steady at very slow exposure speeds. I haven't tested for distortion, as the camera removes most of it automatically, and the rest is easy to remove post-processing. Vignetting at 16mm is equally faint, hardly noticeable. Here's the bottom line: If you have a good Nikon DX camera, like a D7200 or D7500, and you are looking for a very good wide-angle-to-mid-range zoom, and can afford the stiff price of the 16-80, or are willing to buy a used one, as I was, I'd recommend it. But if you want to save some serious money on a new one, the 18-140 offers much better bang for the buck, and the 16-85 is very close to the 16-80. I've been using a 24-85 FX VR as a workhorse lenses, which I will continue to do with my D7200. It is roughly equivalent to the 16-80, although the difference between 16mm and 24mm is significant, even for me. But the 24-85 is another viable, and cheaper than 16-85, alternative to the 16-80. This lens's color transmission, especially at longer wavelengths, like red, is excellent. This makes it a good match to my D7500 with Expeed 5 processor. So it will live with my super-teles and a D7500. This lens, which I bought used, stopped communicating with my D7500, so I sent it to Nikon USA, for a $300 repair. The internal AF system was defective, as was one of the aperture blades. It happens, but shouldn't have with a relatively expensive lens like this one. Anyhow, once fixed, the lens has performed very well, and is a great companion to my 80-400 and 200-500 for mountain scenery, better than the 24-85 and even the 16-85. I highly recommend it. I purchased this lens to go with my D7200. I have mostly been an FX user the last 4 years and currently also own a D750 and D800. My interest in going back to the DX camera and lenses started with using the D7200 as a way to get extra reach for my telephoto lenses such as the Nikkor 80-400mm VR and the newest Nikkor 300mmF4 VR. I was enjoying how well the D7200 worked with these lenses but I no longer had any wide angle "walk around lens" to use with this camera. I did have the Nikkor 24-120mmF4 VR and the 24-85mmF3.5/5.6 VR but those lenses are best suited for the FX format. I purchased the 16-80mmF2.8/4 VR on a whim. Having previously owned the 16-85 version, I hoped that this lens would have the improvements necessary to make it a "keeper". After a few days of testing and comparisons, I must admit that I will definitely keep this lens! My first test was to compare the 16-80 on my D7200 to the 24-120 on my D750. This is an easy test to do as the equivalent zoom ranges and apertures are the same (except for the ability of the 16-80 to go to F2.8). The result of this test amazed me. The 16-80 was sharper at all apertures from F4 through F16. It did not matter what focal length I was at. In addition, the 16-80 was better at contrast. Dark areas were darker, yet had more detail. A side benefit was the lack of any vignetting when a filter was attached to the 16-80 lens. This is not the case with the 24-120 when at 24mm focal length. I then compared the 16-80 (set to 34mm on my D7200) with the Nikkor 50mF1.8 mounted on my D750. Again, I was surprised that the 16-80 actually looked better at all apertures but F4, where the 50mm was slightly better in the extreme corners. Again, contrast was noticeably better on the 16-80. This was the first time any lens I owned outperformed this 50mm prime. I also own the Nikkor 20mmF1.8. Testing this lens directly with the 16-80 on my D7200 did show the superior performance of the 20mm lens, but the differences went away by F8. Both these lenses show the excellent contrast that comes with Nikon's latest coatings. The Nikkor 16-80mmF2.8/4 VR is slightly lighter than the 16-85 but otherwise about the same size. The focus speed seems similar to the 24-120, and the VR seems to work as advertised. At 80mm, I compared the 16-80 to my Nikkor 70-200F4 VR. The first test was done with the 16-80 on the D7200 (set for 80mm) and the 70-200 on the D750 (set to 120mm). The result of this test was almost a dead heat with maybe a slight edge to the 70-200. I would go on a hike with the 16-80 on a D7200 and feel confident that I would get as good or better photos than if I carried the 24-120 with the D750. In low light or the need to have limited DOF, I might want the FX combo, but for most scenery shots, I want maximum DOF and high ISO's are generally not needed. Do remember that DX cameras have 1.5 times greater DOF than FX. This lens is pricey. If I could not afford it, I would be temped by the Sigma 17-70mmF2.8/4. It looks to have similar performance overall. The only caveat, is the distortion. At 16mm, this lens has lots of barrel distortion. Strangely, it goes away by 19mm and quickly becomes pincushion all the way to 80mm. Most zooms seem similar in this regard. Just beware that you will want to correct for this distortion if buildings or ocean etc. are predominant in your images. All in all, it is great to see such lenses come onto the market. The latest 24mp sensors are very demanding. This lens will hold up to those sensors.